We know how popular metallic crafts are, so check out our tutorial below to find out how to use the First Edition Foil Applicator with our free Valentine’s download to use as many times as you like. 1. 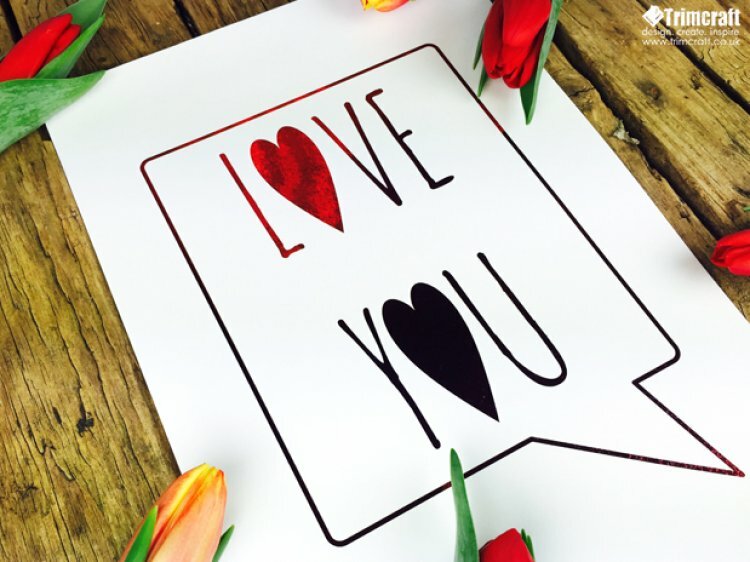 With your laser printer, print the ‘Love you’ design in black with the First Edition Ultra Smooth card. Make sure the printer is set to the maximum ink coverage setting. TIP: You can resize the design for different purposes. Make it smaller for a Valentines card or even smaller to make a tag for your Valentines gift. 2. Pick your First Edition Foil and cut the foil to cover the design. Layer the foil on top of the ‘Love you’ design and cover with a piece of plain white A4 paper so you cannot see any foil. 3. Switch on your First Edition Foil Applicator and wait until it is ready. Carefully pass the design through the machine. TIP: You do not need to push the design through the machine as it will feed through automatically. 4. Once the paper has passed through to the other side of the machine, remove the A4 paper and slowly peel the foil back to reveal your foil design. TIP: Save the peel off sheet as you can use this for other crafting projects. It is such a simple but effective crafting make! This dazzling design is perfect for this Valentine’s day, experiment with colour and size and remember to put your lovely makes on the project gallery!